Nested on the bank of the Thimphu Chu river, our first nights in Bhutan are a blend of natural beauty and modern comforts. Soak up river views at meal times which feature Thai, Chinese, Indian and continental cuisine as well as traditional Buddhist dishes. If you can, find some free time to try your hand at Bhutan’s national sport on their archery field during the day and sit by the fire and enjoy the stars by night. From the river we head to the forest and gorgeous views of the Punakha Valley below. Contemporary design melds perfectly with cultural aesthetics from the quiet of reception to the simple luxury of the rooms with their individual meditation-inspiring balconies. Floor to ceiling windows create a view that enhances the local and organic cuisine from a menu that boasts Thai, Western and Bhutanese options. Bhutanese art and culture are felt from the colors and woodwork of the awe-inspiring reception hall to the subtle accents in each room of this 5-star, wholly Bhutanese owned, boutique hotel. Spacious rooms, all with sitting areas and balconies, include the modern comforts of wifi and heated floors for a luxury in-room experience while a temple, built from the 450 year old timber of the Gangtey Monastery, on the second floor and an outdoor Meditation and separate Tea House complete the beauty out-of-doors. You will want to book your flight into Bangkok International Airport (BKK) the eve before the retreat starts. 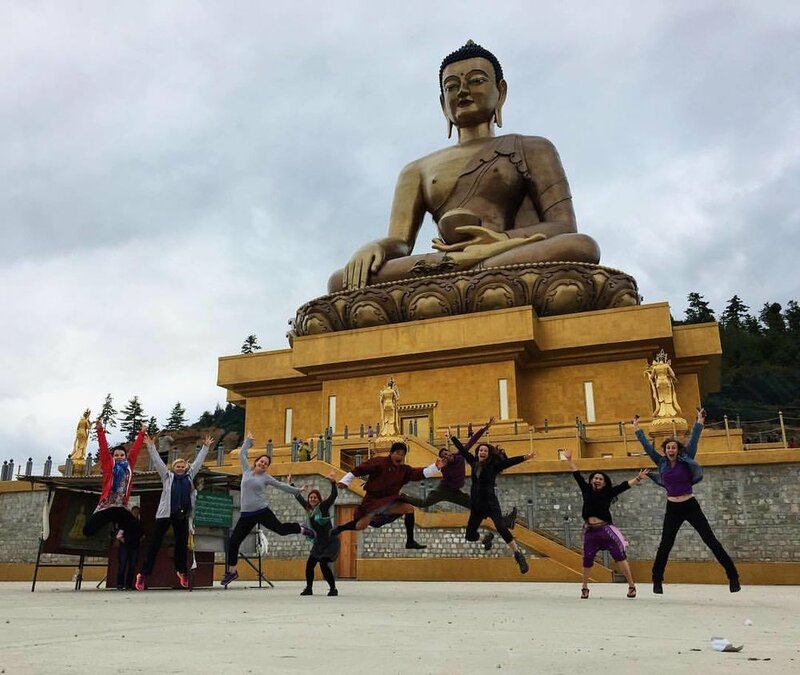 Your flight from Bangkok to Paro is included in the retreat price and you will be boarding very early on the start date of the retreat. Same thing on the return, it's safe to book your flight the morning after the the end of the retreat date... or very very late in the evening on the end of the retreat. Since a pre and post night in Bangkok is pretty standard, we recommend the Novotel Airport Hotel.